Amos Oz Dies At 79; Hailed As 'Glory' Of Israel's Writers The novelist and peace advocate died Friday. He once called the language in which he wrote, modern Hebrew, his "musical instrument" and compared it to "an erupting lava, an earthquake in action." Israeli writer Amos Oz, shown here in 2015, died Friday at age 79. 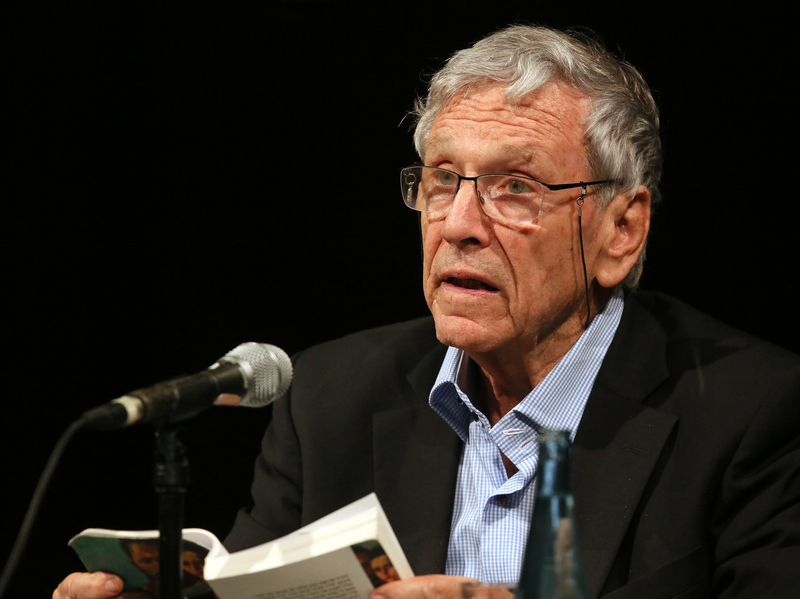 The Israeli literary giant Amos Oz has died of cancer at the age of 79. At the news of his death, Israel's president hailed Oz as the "glory" of the nation's writers. Oz was the author of dozens of Hebrew-language novels, novellas, short stories and essays, including his bestselling autobiographical novel, A Tale of Love and Darkness. That work chronicles Oz's life in Israel, from his childhood in Jerusalem through the birth of the Jewish state and its transformation into a modern nation. Oz was born Amos Klausner in Jerusalem in 1939, into a right-wing Zionist family in what was then Mandatory Palestine. His father, Yehuda Klausner, and mother, Fania Mussman Klausner, had fled anti-Semitism in Eastern Europe. Oz's uncle was a noted linguist; his father, a librarian who wrote at night. In a 2004 interview with NPR's Jennifer Ludden, Oz recalled "bookshelves, lines and lines and lines of books in languages I couldn't read" as the landscape of his childhood. Oz called the language in which he wrote, modern Hebrew, his "musical instrument" and compared it to molten lava. "It is like an erupting lava, an earthquake in action. Every influx of immigrants brings in a new influence and a new input of the language." Oz's childhood ended abruptly at the age of 12 with his mother's suicide. At age 14, he left his family's apartment in Jerusalem for the socialist communal farm at Kibbutz Hulda and changed his surname to Oz — Hebrew for "courage." Life on the kibbutz provided the inspiration for his first book, a short story collection titled Where the Jackals Howled, published in 1961. He also drew on his experience as a first-generation Israeli in novels like My Michael and Black Box. The life of Oz was intertwined with that of his nation. In his 2004 interview with NPR, he recalled the night in November 1947 when the U.N. General Assembly voted to partition Palestine into an Arab and Jewish state. "It was a burst of excitement, fear, hope, almost a messianic fervor. But then five or six hours later, the fighting began between Israeli Jews and Palestinian Arabs, the same fighting that has not ceased until this very day." Oz served as an army reservist in a tank unit in the Six-Day War of 1967 and the Yom Kippur War of 1973. He became a vocal peace activist and was an early advocate for creation of a Palestinian state alongside Israel. In 1967, soon after Israel captured the West Bank and Gaza, he wrote that "even unavoidable occupation is a corrupting occupation." In 2015, he warned, "If there are not two states here fast, there will be one state here. And it will be Arab from the sea to the Jordan River." The last book Oz published, which came out in English last month, was a short work of nonfiction called Dear Zealot: Letters from a Divided Land in which he bemoans Islamic and Jewish fanaticism. In it, the fiercely secular Oz made the case for defining Israel by its Jewish culture, not by religion, and repeated his call for a two-state solution. In a 2013 interview for Tablet Magazine, Oz, one of the most prominent figures on the Israeli left, was asked whether he was hopeful about prospects for peace between Israelis and Palestinians. "It's difficult to be a prophet in the land of prophets. It's too much competition in the prophecy business around here," he said, but he concluded that peace is "unavoidable, and it will come." Oz's works were translated into more than 40 languages. He won many literary prizes in Israel and abroad and was rumored to be on the shortlist for a Nobel. He is survived by his wife, Nili, and three children, Fania, Galia and Daniel.